We’ve already celebrated Christmas and the New Year. So, the presents have been given and all words said. What’s more for us this winter? Despite the fact that these two mass winter old beans are over, we still can celebrate the holiday of love and relationships. Yes, I’m here to talk about St. Valentine’s Day, which is coming this February! Meet plenty of red paper hearts, flowers, and lovely gifts soon! However, this post is not about this romantic day. It’s about a free wedding-related template from our team, which you can explore while taking your wedding business online. St. Valentine’s Day is a real wedding booster. Moreover, a lot of people choose this day as their wedding date. Therefore, it’s time to spice up your wedding planner agency on the eve of this holiday. For this reason, we prepared for you a free and new Jen + Ben wedding planner WordPress theme, which comes in handy for everyone, who would like to practice in building beautiful wedding websites. The theme is very intuitive and comes with a wide range of features. So, you can learn it in detail and improve your site’s building skills. So, here we go! Jen + Ben wedding planner WordPress theme has a colorful, gentle, and fully responsive design with captivating backgrounds and a full library of Google web fonts. These features will help you to create a wedding site’s project of your dreams. Moreover, here you get cross-browser compatibility that, together with responsiveness, creates a top-notch performance of your website on different screen resolutions and in a variety of web browsers. Here you get a WordPress Live Customizer, which allows you to customize your future website in a real-time mode and with no need to reload the site’s page. The whole editing process is pretty simple for people of different ages and professions. For now, content is everything, so, it’s quite important to show it up correctly! 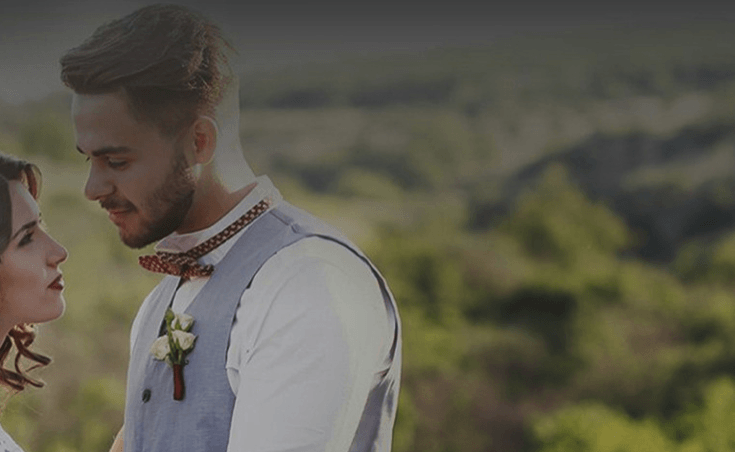 Fortunately, Jen + Ben wedding WordPress theme comes with a wide variety of content modules, which will help you highlight the primary information and display it using various buttons, tables, sliders, and much more! Also, feel free to tweak any of these modules the way you like. Being fully drag & drop, this feature will help you to create amazing and professional-looking layouts without touching a line of code! Build layouts of any complexity on the fly, use versatile configuration options, and more! Jen + Ben free WordPress theme is clean and clear, so you will have a pleasant user experience at a glance! If you would like to find a premium theme after practicing, you’re welcome to look at our gorgeous wedding WordPress themes collection! Do you like this free sample? Which free template do you like the most? Please, share your thoughts in the comments section below and stay updated with our blog. Thanks for reading!